Starting with full disclosure, I was invited to this event and given a media ticket (aka a free one) to help spread the word of their new beer all while sharing the experience with other members of the local blogging community – thanks for the invite by the way, please do consider me inviting me to future events! 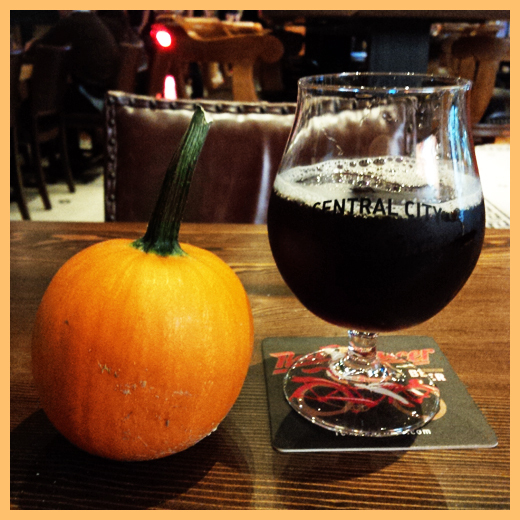 Central City Brewing Great Pumpkin Party & Patrick O’Pumpkin Launch: On Tuesday, September 1st, Central City hosted a harvest themed Great Pumpkin Party at their new Brewpub in Vancouver, BC. At the pub they regularly feature 40 taps of mostly local brews that include everything Central City makes with a host of rotating guest taps. 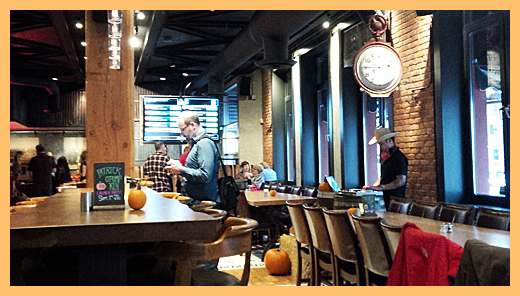 The new brewpub, housed in the old Dix BBQ building, is a beautiful spot with a great menu, beer selection and is a perfect location to hang out and pre-game, even if just for the food. 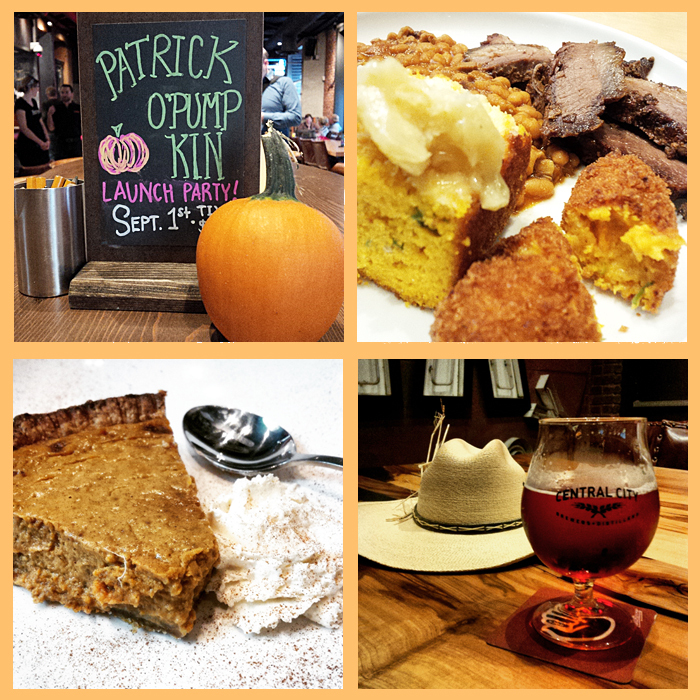 Anyway, this was also good spot to host the launch party for their new Barrel Aged Imperial Pumpkin Ale named Patrick O’Pumpkin which I got to try for the first time at this special launch party. Overall Impression: For me it was great to hang out with a few other local beer bloggers at an event like this and although perhaps it felt a bit early for fall themed beers and pumpkin flavoured things, basically Autumn had pretty much arrived in Vancouver in late August in the form of a massive wind storm. Attendees were given three tickets for any Central City beer (including the new one) and a food ticket that was good for a fixed plate meal and the feature dessert. When the party officially kicked off, Gary (their brewmaster) poured Patrick O’Pumpkin from a gigantic freshly kegged pumpkin after giving us a brief background speech on the beer in front of a small crowd of enthusiasts. Eventually we all sat down with a fresh pumpkin beer and throughout the night enjoyed the meal, devoured the dessert, and consumed a respectable amount of beer all while discussing all things beer, food and blogging. I personally had a blast and count on coming back to the pub again soon, but in the meantime here are some of my more detailed thoughts on the event and the tasty stuff they served us. Cost/Value For Money: Tickets were on sale for $30 each and if I had purchased one to attend, I absolutely would have felt that the value for money was great, especially with the quality of the meal and beers. A normal night out like this in Downtown Vancouver would have easily cost you double the cost of the event ticket, three drinks, a quality meal and a dessert will easily run you more than $60 anywhere in the city. Upon leaving, we were also given a bottle of each of their pumpkin beers to take home, which was an unexpected and generous party favour that made everyone gleeful as they left the pub! 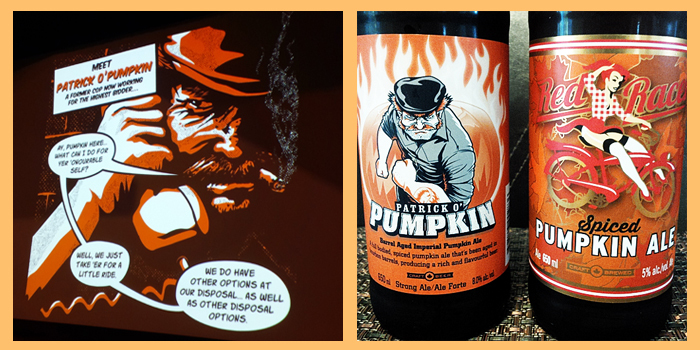 The Beer: All night I used my tickets to drink the new Patrick O’Pumpkin beer, which is the third edition of their four part comic book themed beer release effort. I kept ordering it because I thought it was excellent, but I’ll confess to having a couple Imperial IPA’s as well because it’s another great one. My favourite pour of the night was the beer from the freshly tapped pumpkin, something I do at home annually on a smaller scale around Halloween time. When you let a pumpkin beer rest in a freshly carved out pumpkin for a few hours, you get some seriously fresh pumpkin flavours that aren’t replicable in a normal pumpkin beer. No matter how many fresh pumpkins you use in the mash, it’s much better to keg a pumpkin and enjoy your pumpkin beer this way. I found that the new beer had some really nice vanilla and oak notes from the barrel aging that were present but not in an overpowering way, which were then succeeded by mild pumpkin flavours with hints of nutmeg and spice to round it off. I prefer pumpkin beers to show hints of pumpkin, without going too crazy on the spice front and Mr O’Pumpkin delivered the goods here. I’ll be buying more of these when they are released to the masses and will certainly save a few in the cellar for next year to see how it ages. The Food: At mealtime we were served a pre-plated meal of BBQ Brisket, Pit Beans, Pumpkin Seed Slaw, Pumpkin Cornbread and a Smoked Pumpkin Croquette as our main dish, followed by a Pumpkin Beer Pie with a Malted Barley Crust for dessert. Everything was quite good and infused with pumpkin in some sort of way, but for me I thought the Pit Beans and the Smoked Pumpkin Croquette were the true highlights of the main course as each were uniquely flavourful and stood out in an already delightful meal. For the dessert, the beer infused pumpkin pie thankfully was accented mildly with the beer and the malted barley crust was wickedly thick and crunchy showcasing hints of sweet dark sugars throughout the pastry. The food was great, and despite pretty much everything having some pumpkin enhancement, it didn’t feel like anything was overdone or gimmicky. Needless to say, I was impressed and left with a stomach full of delicious food and beer!